Man, what a cold and blustery day. Not the best day to go out peregrine watching, but Matt had the whole day to do so and that can’t be wasted! By the time I met up with him at Wacker, he’d already been to three other sites, but he wasn’t complaining about the cold and wet in the least. 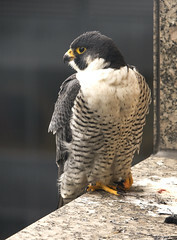 We got up to the room off the ledge and opened the door to peer down at the female in the nest box. She was down tight on the eggs, glaring at us, and this was good. The day was far too cold for her to get up and, honestly, we didn’t want her to. We’d made a decision to stay just long enough to maybe get the male’s bands and to see that the pair was, indeed, incubating. The male came in moments after we opened the door. He landed behind me, on the other side of the open door, so I had Matt hold the door open and assumed a very, very awkward position so that I could shoot through the tiny window in the top of the door — sort of arms up and unbraced while doing a deep lateral squat against the wall. As soon as I focussed in on the male, he sat down on his feet, completely obscuring his leg bands. This is VERY common behavior and one that I have to constantly tell my self is not purposeful obstinacy on the bird’s part. By the time the male, as it turned out Joe (b/g 59/H), gave himself a good head scratching and showed bands, the muscles in my legs and arms were about to give out. I snapped the shots before I collapsed and got the leg bands! Man, my legs and arms are still sore. So, welcome back Joe! Good to see you, buddy.